Coloured glass glitter is made from thin glass flakes and used for decoration purposes. Published analytical data mainly originates from restoration sites in different countries and is still fragmentary. Samples are often contaminated or corroded, which makes it difficult to evaluate the results, particularly when these were obtained by near-surface techniques. For this investigation, six types of coloured glass glitter from an eighteenth century material collection from Cambridge, England were investigated by optical microscopy and electron microscopy/energy dispersive X-ray analysis in order to obtain a wide range of data, which can be used to examine the production techniques of eighteenth century coloured lead glass glitter. They have been stored in a wooden cabinet for 300 years and were sampled directly from the original small paper boxes. Each sample contained glass flakes of different sizes and thicknesses and even different colours. All flakes were made of lead glass with lead contents in the range between 18 to over 70 wt%. One group showed mixed alkali compositions, probably from potash, lime and nitre, the other contained sodium, potassium and calcium oxides only in trace, if at all. Colouring elements were cobalt, copper, iron, manganese and gold resulting in blue, green, yellow and violet. Although the colouring elements resemble mostly contemporary recipes as known from Neri and his translators, the glass composition is clearly different and differs also from other lead glass compositions from that time. This is a first indication of the production technology of eighteenth century glass glitter. 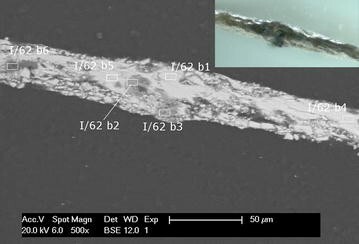 A wide range of analytical data obtained from early eighteenth century glass flakes is presented here and is discussed with regard to the composition of lead glasses, colouring elements, and manufacture details. 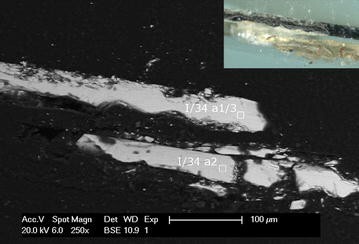 Lead containing glass glitter is often found in restoration sites, but their manufacture is still waiting to be thoroughly investigated. Almost nothing is known about its historical manufacture. The study provides a wide range of data, which allow to further increase our knowledge on composition and manufacture of these often used decoration materials from the eighteenth century. The Vigani Cabinet is a collection of over 570 raw materials from plants and animals, inorganic materials such as pigments, stones and metals as well as 50 drugs and oils in an almost untouched condition. The cabinet was compiled in a systematic manner, presumably to serve as a lecture cabinet by the Italian scientist John Francis Vigani in the years 1704/1705 at Queens’ College in Cambridge, England . In the “pigment” drawer of this cabinet, several samples of glass glitter can be found (Fig. 1; Table 1). They are sorted by colour, i.e. the blue glitter is placed beside the blue pigments, the golden glitter beside the yellow pigments etc. All specimens are kept in labelled paper boxes within their wooden compartment of the drawer (Fig. 1). In this study, that glass glitter is investigated and analysed in order to provide a range of data which can contribute to the knowledge of eighteenth century production techniques for coloured glass flakes, because this kind of material indeed has been found in restoration sites, but details of its manufacture are still waiting to be investigated. From the fifteenth century on, small glass particles were used as additives to paint layers [2–5] and as decorative materials in wall paintings and plaster [6–8]. Powdered glass particles were found in priming and paint layers of several European paintings from the fifteenth to the seventeenth century [3, 9]. A lead glass sample from a late fifteenth century German altarpiece also contained copper as colouring agent . In the sixteenth century glass was added mainly for technical purposes such as siccatives and grounding. Laboratory testing carried out with modern ingredients indicated that the glass content was due to a better texture and colour depth of the tested red lakes . A similar approach can be assumed for glass flakes used in plaster decorations. Glass flakes from 1722 in the Sala Terrena of Weissenstein Castle at Pommersfelden, Bavaria, were found to be lead glass with copper and iron as colouring elements . Glass flakes on stucco work from 1714 in the former Grotto Hall in the Zwinger of Dresden (now Mathematisch-Physikalischer Salon), Germany, were mainly made of lead glass as well besides some examples being soda-lime glass . English and German lead glass is reported individually from the Middles Ages on [12, 13]. These glasses are either made like the usual local glass plus some lead added to the glass melt or only from sand and lead without other fluxes, which results partial in very high lead contents up to 70 wt% or more . The English early modern lead crystal was manufactured from the 1670s on [14–16], introduced into London by Ravenscroft and adopted by other English glassmakers from the 1680s on [15, 16]. Assumingly, the recipe was adopted from Venetian lead glass, known from the fifteenth century on [14, 16]. Seventeenth century recipes use quartz sand or “stones from tarso”, “Levantine” or “Hispanic soda” for crystal or common frit, a premelting mixture of the glass contents. To this frit litharge is added [17, 18]. Calculated lead contents are different for known recipes from the sixteenth to the seventeenth century, Moretti gives 20 % for an anonymous manuscript from the fifteenth to the sixteenth century, around 56 % for Neris lead crystal and completely varying contents for the recipes of a glass beads manuscript contemporary to Neri (20, 45, 50, 56 and 66 %) . Another Italian manuscript from the end of seventeenth century gives quartz sand, arsenic, ceruse, borax, minium, nitre, “tartar” and “ammoniac salt” for lead crystal, wich results in calculated lead content around 20 % , whereas Ravenscroft supposedly used quartz sand and/or flint stones, borax, nitre, “(calcined) tartar” and litharge [14, 16]. The hypothesized lead contents for this glass vary between 9 and 28 % . Early English lead crystal was found to be potassium-lead-silica with increasing lead contents towards the end of the seventeenth century (12–40 wt%) [16, 19]. also found mixed alkali glasses, which however contained no lead. Ravenscroft may have used potash instead of the expensive borax, and after the expiration of his patent other glass makers probably adopted his technology [14, 16]. While the English and German translators of Neris “L’Arte Vetraria” adopted the proportions of silica and lead oxide, German encyclopaediae from the middle of the eighteenth century give lead oxide and sand in the proportion 2 + 1  or 4 + 1 and higher  together with nitre or common salt, while the colouring ingredients for the most part are identical with that given by Neri and its translators [17, 18, 20, 21]. It is not known whether English glass makers adopted these recipes also for the production of glass glitter. The “lead crystal” in the Venetian style was probably not viscous enough to be used for blown glass in the Venetian style [14, 16, 17]. Literature assume, that cullet was used for powdered glass contents in paint layers , but for the glitter another possible manufacture is described: Molten glass is blown into a large sphere and then shock-cooled in cold water, which causes it burst . This would require a specific glass viscosity. The analytical results for seven analysed glass glitter samples from Vigani’s cabinet are given in detail in Tables 2 and 3. The flakes from one compartment generally show similar compositions with respects to the main constituents silicia, lead, alkali and calcium oxides, regardless of their differing colour or appearance. For three flakes (I/3b, c; Fig. 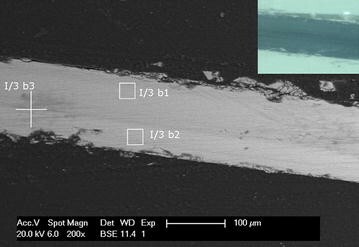 2; I/59a2, a3; I/60) several areas were measured on the same flake, which showed a very homogenous glass composition. Minor constituents, which could not be quantified in this study such as arsenic, manganese, iron and copper oxides, usually are present in all measured flakes of one sample. Exceptions are three colourless flakes from I/39, of which the lead contents increases with the thickness of the flakes, and the brown flakes I/59, where the thin flakes contain notably higher amounts of lead oxide than the thicker ones. An unusual exception from these finding is sample I/62 (Fig. 3) which shows on a brownish red coloured flake several areas with enriched metal oxides contents while silica and lead oxide are absent (details see below). Sample I/3 shows a rectangular flake of greyish blue (spots I/3b1-b3; Fig. 2) and dark blue colour (I/3c1, 2), respectively. Both flakes contain high percentages of PbO (around 20–23 wt%; Table 2), while the concentration of the alkali elements differs: flake I/3b contains more Na2O and CaO (about 6–9 wt% and 5–6 wt%, resp. ), I/3c more K2O (around 9 wt %). Colouring element is cobalt, in the flake I/3b also copper (Table 2). Both flakes contain chlorine and As2O3, I/3b contains also MnO. Arsenic and manganese both reduce the colouring by the iron oxide present in both flakes  (Table 2). The dark inner zone in I/3b (spot I/3b3; Fig. 2) shows slightly decreased percentages of PbO and Na2O and increased content of K2O and CaO compared to the lighter regions of the flake (I/3b1, I/3b2; Table 2). Due to the relative amounts of alkali calcium oxides and the presence of MgO and chlorine, soda ash was very likely used as a flux . Another possibility is the use of potash together with a sodium delivering ingredient (soda, borax). The dark zone therefore may result from insufficient mixing during the glass melt. Sample I/39 shows three rectangular and colourless, transparent flakes of differing thickness. The composition is very similar to that of sample I/3 (Table 2). It also seems that apart from the higher lead content also the composition of the fluxes has been varied during production. All three flakes contain MnO, I/39b1 also traces of Fe2O3, but no other colouring elements (Table 2). Sample I/60 shows a rectangular, turquoise flake. It resembles other flakes with similar PbO, Na2O, K2O and CaO levels, such as I/3b1 and I/39b1 (Table 2). Also the composition of the minor constituents resembles I/3, apart from cobalt, which is not present in I/60b (Table 2). Even Fe2O3 and CuO are present in traces in I/60b1, copper is most probably the reason for the blue colour, while the green tint of Fe2O3 is eliminated by the present As2O3 and MnO (Table 2). Compartment I/62 of Vigani’s cabinet contains flakes of different colour, mainly purplish flakes with some smaller yellow flakes (Fig. 1c). Sample I/62b (Fig. 3) shows a splintered flake with a conchoidal fracture. It contains a dark knot, which was not found in other flakes from that sample. The light and glassy areas (I/62b1, b4, b5) have a high lead content approaching 45 wt% (Table 2) and noticeable percentages of Na2O (4–5 wt%), K2O (3–4 wt %) and CaO (around 3 wt%). This composition resembles the other samples with a mixed alkali content (I/3, I/39, I/60). However, the relation of the alkali elements to each other in I/62b1, b4 and b5 is different compared to those in I/3, I/39 and I/60, where always either Na2O or K2O is dominant. Furthermore, spots I/62b1, b4, b5 do not contain chlorine, which indicates a different flux to that used for the flakes I/3, I/39 and/60, which all contain traces of chlorine (Table 2). Several dark areas are visible under the electron microscope (I/62b3, b3 and b6; Fig. 3). The two spots in the centre of the knot (I/62b2 and b3) consist mainly of MnO, Fe2O3 and NiO, with small percentages of CoO (only I/62b3), CuO and ZnO (Table 2). In I/62b2 also traces of Sb2O3 are present (Table 2). PbO is completely absent and silica is present only as a minor constituent (1.7 wt%; Table 2). MnO and Al2O3 are present in traces similar to the glassy areas (I/62b1, b4, b5), while the alkali elements are missing. This indicates that fluxes such as lime, sodium or potassium salts were not mixed sufficiently here with other glass melt constituents. The concentration of CuO does not significantly differ between light and the dark areas of the flake, while MnO, Fe2O3 and NiO show highly increased percentages in the dark areas (I/62b2, b3) indicating that they were added as independent constituents, probably as manganese ore, which was used as a glassmakers‘soap. Fe2O3 as well as CoO and ZnO are present in I/62b2 and b3 in significantly increased percentages—but not identified in I/62b1, b4, b5 for sure—probably were added for colouring purposes. Literature mention that “Manganese of Piemont” (manganese ore) was used to produce a lead glass of golden colour [17, 18, 24, 25], and smalt (cobalt glass) and “calcined tin” (SnO2) for a glass of the colour of lapis lazuli [17, 18, 26, 27] and manganese ore and “zaffre” (CoO) for a sapphire glass . This corresponds with the brownish purple colour of flake I/62b, which contains manganese, iron and copper in its glassy areas, and a colourless flake I/62c (data not shown here), which contains only manganese. Mixed together the compartment contains flakes of varying purple colours and also yellow ones (Fig. 1c). The dark spot I/62b6 under SEM seems to be the complete opposite of the metal enriched spots (I/62b2, b3). Main constituent is silica (80 wt%; Table 2) with a low concentration of PbO (8.6 wt%; Table 2). Alkali oxides are present in traces, only CaO shows the same amounts as in the glassy areas I/62b1, b4, b5 (around 3 wt%; Table 2). In contrary to the metal enriched areas (I/62b2, b3) MnO and Fe2O3 are found only in traces. Sample I/18 shows two rectangular, splintered flakes of a dark green colour (I/18b). Both flakes (I/18b1 and I/18b2) contain a high concentration of PbO (56 and 57 wt%; Table 3) and a very low concentration of Na2O, K2O and CaO (all around 1–2 wt%). The green colour is caused by Fe2O3 (no MnO was found) and significantly increased percentages of CuO compared to other samples (Table 3). The sample also contains light green flakes, which are not shown here. Their composition is identical to that of the dark green flakes I/18b1 and b2. The Venetian recipes mention “common frit” for the manufacture of green glass, which is made using impure “Hispanic soda” and therefore shows a bluish or greenish colour [28, 29]. Colouring ingredients were brass, CuO and iron oxides made from iron chips and vinegar [17, 18]. Such a glass, however, would contain higher amounts of K2O and CaO, when other fluxes were used. Sample I/34 (Fig. 4) shows a rectangular brown flake (I/34a1, I/34a3) and a splintered yellow flake (I/34a2). This sample is the most splintered one of the analysed data. Both flakes contain high percentages of PbO (65–66 wt %; Table 3). Findings of alkali oxides lay mostly below the detection limit. Only in I/34a2 CaO could be identified certainly but was not quantified (Table 3). However, Fe2O3 and CuO are present in significantly increased percentages (Table 3), which corresponds to contemporary recipes, which use “brass thrice burned” or calcined copper chops as well as iron chops mixed with vinegar to produce a “powder of the color of bricks” to be melted together with the silica and litharge to make yellow gold colour [17, 18]. In both spots, gold (Au2O3) is present in significantly increased percentages (Table 3). It is likely that the use of gold for the production of ruby glass was known to English glassmakers around 1704, when the Cabinet was compiled, mainly because of the Italian connection outlined under background above, where recipes for red glass using gold were known from the late sixteenth century on . However, currently there are not enough data on coloured glass flakes, therefore this conclusion remains speculative. As can be seen in Fig. 1a, brown and yellow flakes were stored together and named “Gold fr.”, probably because both types mixed together indeed appear in this colour. Sample I/59 shows three rectangular, brown to red flakes with a conchoidal fracture. They are of varying thickness, two splintered thin flakes contained 52, 73 wt% PbO, respectively (I/59a1–a3; Table 3) and a thick homogenous flake 60 wt% PbO (I/59a4; Table 3). Also other thin reddish flakes from the sample (data not shown here) contained over 70 wt% PbO. Since not all thin flakes contain such high amounts of PbO, several thin flakes in the mixture of coloured flakes in compartment I/59 must have come from another batch. The composition of the minor constituents (alkali and calcium oxides, Au2O3, MnO) is similiar to I/34: Na2O is present for certain only in I/59a1 and a4, K2O and CaO are present in all spots in traces (Table 3). In contrary to I/34 no CuO and Fe2O3 but in I/59a1 and b4 MnO were found (Table 3), which causes the more violet colour of I/59 compared to I/34 (Fig. 1a, b). Not surprisingly, the composition of the different coloured glass flakes does not match the composition of English glass objects like drinking vessels or bottles of late seventeenth and eighteenth century, which are reported to be mostly high potassium-lead glasses [14, 16]. Mixed alkali glasses with a compositions similar to that found in this investigation for the flakes I/3, I/39, I/60 and I/62 (Figs. 2, 3; Table 2) are reported for a late seventeenth century glass manufacture in Silkstone, however not containing lead . , who investigated a wide range of glass particles from paintings from the fifteenth to the seventeenth century occasionally found lead glass (made with wood ash) or mixed alkali glass without lead. The Italian glasses investigated by these authors date from the sixteenth century, when lead glass was known but not common in Italy. Similar considerations may be true for North European and English glass production, where lead glass is reported occasionally for the Middle Ages [12, 13]. These medieval lead glasses, on the other hand, show very similar compositions to the high lead glass flakes with only traces of alkali and calcium oxides investigated here (I/18, I/34, I/59; Fig. 4; Table 3) . In contrary, eighteenth century glass flakes used in plaster decorations from Germany were mainly mixed alkali glass without lead (Weissenstein Castle 1722) or high lead with low potassium and calcium content (Grotto hall Dresden 1714) [10, 11]. The differing lead contents within both groups analysed in this investigation also correspond to reports about glass makers from the end of the seventeenth century experimenting with the lead content of their glass melts in order to stabilize the resulting glass objects, but also to increase the brilliance, refractive index and density of the glass [14–16]. Similar considerations may be true for the mixed alkali content of the flakes I/3, I/39, I/60 and I/62. Some compositions indicate the use of soda rich plant ash or potash with borax. Also the use of the ingredients mentioned in the recipes of Ravenscroft (tartar, nitre, borax) cannot be excluded here. All these properties could be useful for glass glitter used for decoration purposes as well. Also the decrease of viscosity of the melt caused by PbO, “which makes it most tender as a candle” , was probably an advantage in processing the glass. All high lead glass flakes (I/18, I/34, I/59; Fig. 4) are significantly more brittle than those with a mixed alkali content (I/3, I/39, I/60, I/62; Figs. 2, 3). Probably, the glass producers tried to achieve a low viscous and brilliant lead crystal without the need to reduce brittleness and macroscopic stability. 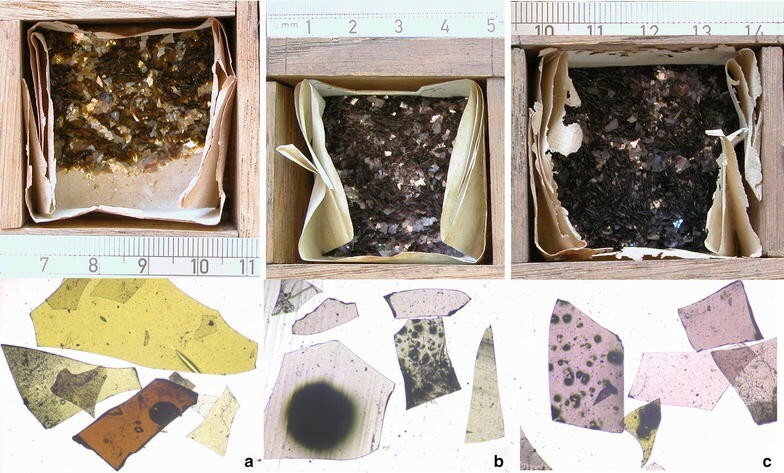 Colouring elements in the glass glitter analysed in this study were similar to other glass flakes [10, 11], and also matched contemporary recipes [17, 18] (Table 4). Different coloured flakes mixed in one compartment of Vigani’s cabinet seem to be intended to achieve a specific colour impression. These results together with a relatively stable lead content within a compartment, but changing for different compartments and colours, indicate that the manufacture of the differently coloured flakes was on purpose and not using cullet of glass waste. Samples of a few milligrams were taken from each compartment of the Vigani Cabinet containing coloured glass glitter. They were investigated by stereo microscopy. Some flakes from each sample were embedded in synthetic light-curing resin (Kulzer Technovit 2000LC) and prepared as polished cross-sections. These specimens were investigated with reflected-light microscopy. Afterwards, the cross-sections were sputtered with carbon and investigated by scanning electron microscopy (SEM) and energy dispersive X-ray spectroscopy (EDAX) in a Philipps XL30 with an acceleration voltage of 20 keV. EDX measurements were made with a spot size of about 15 μm, an acceleration voltage of 20 keV, X-ray detector at 74 μA, UTW detection type and signal scan over 250 live seconds. After manual background correction, the composition was determined by ZAF standardless quantification using standard profiles stored in the system. Main glass constituents were quantified and normalised to 100 %. For these constituents the accuracy was determined by analysis of glass standards (Schott, Mainz, Germany: S19, S20, S21, S23). The relative errors were 2–5 % for Na2O, 11–18 % for MgO, 12–16 % for Al2O3, 3–6 % for SiO2, 15–17 % for K2O, 13–16 % for CaO and 1–5 % for PbO. The relative error of major components in concentrations of 10–100 % is given in literature with 1–5 % and for concentrations of 1–10 % with % 3–10 % . The minimum detection limits were: 0.75 wt% for Na2O, 2.26 wt% for MgO, 3.8 wt% for Al2O3, 0.27 wt% for SiO2, 0.48 wt% for PbO, 0.47 wt% for K2O, 0,82 wt% for CaO. In some cases (MgO and Al2O3) concentrations below the detection limit were calculated, where a peak was clearly visible. Fe2O3, CoO and CuO were not quantified with the exception of sample I/62b2, b3 and b6, where they were the main constituents. The accuracy of analysis of some minor constituents was determined using cobalt glass standards R2 and R3 . The relative errors were 3–12 % for Fe2O3, 1–6 % for CoO, and 1–4 % for CuO. The relative error of minor components in concentrations of 1–10 % is given in literature with 3–10 % . The minimum detection limits were: 0.56 wt% for MnO, 0.67 wt% for Fe2O3, 0.52 wt% for NiO, 0.83 wt% for CuO and 1.95 wt% for ZnO. GS prepared the samples, performed the chemical analysis and determined the compositional data. CH helped to draft the manuscript and revised it critically, while the figures were recorded and edited by GS. Both authors read and approved the final manuscript. Gundel Steigenberger studied Applied Science at the Bergakademie Freiberg, Germany, with a focus on environmental analysis and afterwards attained her doctor from the Technical University Dresden and the Academy of Fine Arts Dresden, Laboratory of Archaeometry. The topic of her work was the analysis of the resinous contents of the Vigani Cabinet by gas chromatography and mass spectrometry as well as the historical nomenclature of those materials. This investigation was funded by a stipend from the Stifterverband der Deutschen Wissenschaft and KulturInvest foundation. The authors are greatly indebted to The President and Fellows of Queens’ College, Cambridge, for allowing the samples to be taken from the Vigani Cabinet at Queens’ College, and to Dr Brian Callingham, of Queens’ College, Cambridge, for his help with the project and for taking the photographs. We are also very grateful to Dr Sylvia Hoblyn for her assistance during the experimental work. Many thanks go to Christian Gruber from Bayerisches Landesamt für Denkmalpflege (Munich, Germany) and Rainer Richter from Staatliche Kunstsammlungen Dresden (Germany) for providing the glass standards as well as to Stefan Röhrs for reading the manuscript. Spring M. Colourless powdered glass as an additive in fifteenth- and sixteenth-century European paintings. National Gallery Technical Bulletin; 2012. p. 33. http://www.nationalgallery.org.uk/technical-bulletin/spring2012. Krünitz JG. Oekonomische Encyklopädie oder allgemeines System der Staats- Stadt- Haus- und Landwirthschaft, vol. 5, Blei = Glass. Pauli; 1775. http://www.kruenitz1.uni-trier.de/(16.12.2015). Spiegl W. Die Geschichte vom Glasmachen 1550 bis 1700—Waldglas, venezianisches cristallo, böhmisches Kreideglas. 2002. http://glas-forschung.info/pageone/pdf/cristallo.pdf. Völksch G. Rasterelektronenmikroskopie und Elektronenstrahlanalyse. Institut für Glaschemie, Universität Jena http://www.chemie.uni-jena.de/institute/glaschemie/Anleitung_REM.pdf.